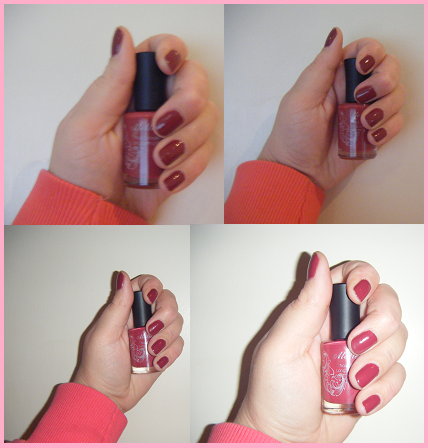 Today I’m wearing Passionate from the new Classic Nail Gloss collection at MEMEME Cosmetics. Mememe are a boutique brand with gorgeous packaging and some raved about products that I’ve been dying to try. They recently held a competition where you had to tag yourself in a photo of your favourite coloured nail gloss on Facebook and I actually won the nail gloss that I tagged myself in! They have loads of gorgeous colours on their website which are all priced at £4.50 which isn’t bad for the amount you get and the quality of the nail gloss… plus they’re on 3 for 2 at the moment! When I received the nail gloss I was over the moon but I did notice that the colour looked a little different to how it did on the photos on the website. It is definitely the correct nail gloss, it just looks a lot darker and differently toned. This wasn’t a problem for me though because it gave me an opportunity to try a colour I wouldn’t usually buy in store. 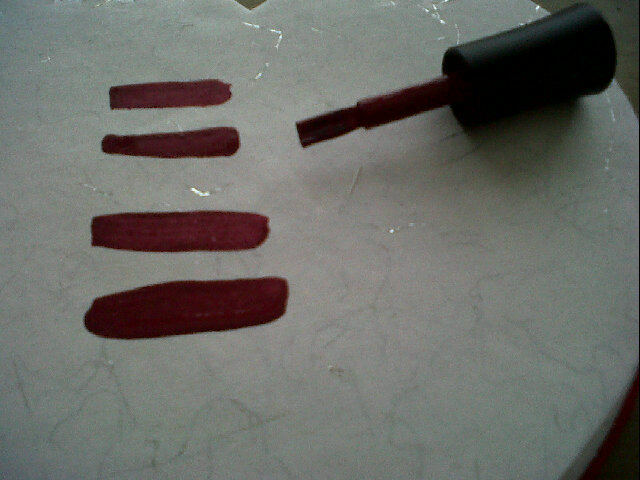 I thought Passionate looked like a pinky red but its actually more of a dark red. Sometimes I look at it in the bottle and I can see the pink elements that I saw on the website but mostly its a dark red colour. Its quite hard to photograph to get the true colour but I’ve given it a go! When I received the nail gloss it came in a little jiffy bag with a cute little note. Thank you Me Me Me. Calling this a Nail Gloss rather than a nail polish/varnish/paint is great because it really is glossy. It doesn’t need a top coat at all, if you usually just use a top coat to gloss up your nail polish. ﻿Application of Passionate is smooth and it has a thick consistency which means that you only need to use one coat. I always do two anyway, just to make sure I haven’t missed out any edges. The nail gloss takes a little while to dry but that’s probably because it is quite thick. The colour is gorgeous. Very autumnal and looks different in different lights, it changes from being quite a dark red to being a wine red to being a brown red. Very pretty and on trend. I don’t often sport dark coloured nails so this gorgeous colour is a welcome addition to my nail collection. There is mainly only one thing that I don’t like about the new nail gloss collection and that is the size of the brush that comes with the nail gloss. I had read about the ‘New Maxi Brush’ and had high hopes for it as I thought it would be like the Xpress Brush by Rimmel which I cannot rave about enough. Sadly I was wrong. The brush is just far too big. It really takes some getting used to and I must admit it does put me off buying the nail gloss collection despite there being some gorgeous colours on offer. Hopefully you’ll be able to see what I mean below. I’m assuming the whole point in the maxi brush is to make application faster and although it does make it faster to apply the nail gloss, it ends up taking twice as long as it normally does to apply nail polish because of the clean up around the nail afterwards. I have a really big nail plate and this brush makes for a quite a sloppy application so lord knows what its like for the majority of people who have smaller nail plates than me! I’m sure ill be able to get used to it though and I think if you really like the colour of something, then you will try your best to work with it regardless. Its not something a cotton wool bud and a bit of nail polish remover cant fix! It hasn’t put me off buying from MeMeMe as I really like the look of their ‘Blush Me’ blush box collection. They come in little boxes that are extremely similar to the Benefit boxes and the colours look beautiful- all the shades that I love and look for in a blusher. Have you tried anything from MeMeMe Cosmetics? What are your thoughts on the maxi brush? Next Post There’s No Business Like Snow Business! Luckily enough I bought this in superdrug, so I knew the colour I was buying. I found the brush unusual. It was much better shaped for where the cuticle meets the nail, and I think I could get used to it. Love the colour!